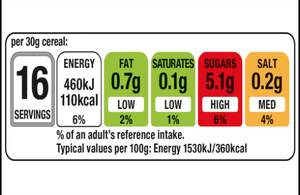 The new voluntary UK front of pack Nutrition Labelling Scheme launched on 19/6/2013 will use Reference Intake information – this was known as Guideline Daily Amount. It will show levels of energy, fat, saturates, sugar and salt in red, amber or green if the traffic light system is used. The RIs are defined in a new piece of legislation called the Food Information to Consumers Regulation. You can download the document on this link. The Regulation provides RIs for use on a label for Energy kJ, kcal, fat, saturates, (total) sugars, and salt and these are the same as the current ‘adult’ GDA values, with the exception of protein which has changed from 45g to 50g and carbohydrate which has changed from 230g to 260g. RIs (part B of Annex XIII of EU FIC – see Table 1 below). Note: When re-labelling to meet the requirements of EU Regulation 1169/2011, you must use the RIs set out in the Regulation. There is currently no provision in the Regulation for the use of Children’s RIs. The European Commission and Member States have powers to adopt rules setting RIs for “specific population groups” (including children), but have yet to do so. In addition the following statement must appear close to where information on Reference Intakes are given ‘Reference Intake of an average adult (8400kJ/2000kcal’). Companies who currently provide nutrition information have until December 2014 to change their labels to be compliant with the new legislation, although can make the changes before this.